Meredith has jumped aboard the gluten hate/profit train and announced a partnership with the food mag GFF: Gluten-Free Forever. Under the agreement, Meredith will handle distribution and ad sales for the title, beginning with its spring issue. GFF was founded in 2014 by editor in chief Erika Lenkert. Lenkert and her staff—who are based in San Francisco—will stay on with the magazine. 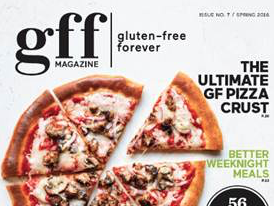 “With the increasing consumer demand for gluten-free recipes and products, GFF fits into our portfolio of wellness-minded publications, resonating with Meredith readers who are looking to adapt a more health-conscious lifestyle,” said Meredith Group editorial content director Doug Kouma, in a statement. GFF has a newsstand circulation of 250,000 and sells for $9.99 an issue.